→Neoflam Cookware Review – Should I Buy ? In today’s modern kitchen we really want every kind of pot and pan there is to prepare and cook our food. There are so many cookware sets out there, but sometimes they just don’t have the desired pot or pan we want. When it comes to finding a wok, as part of a cookware set, well, this can be something of a novelty. 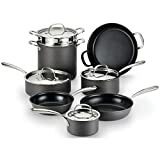 However the 6 piece cookare set by Neoflam does feature a wok, a stockpot and several sauce pans. It is also made of cast aluminium, which is also something of a rarity. Below, we offer you our full review. Cast aluminium is an alternative to cast iron. Many people prefer it, as it has the same sturdy ability and hard wearing capability as cast iron, but it is a third lighter. This makes moving full pans and pots around the stove that much easier. Cast aluminium has a very high heat capacity and requires no pre heating. Temperatures are reached very quickly and food cooks efficiently. Cast aluminium is also relatively easy to wash and clean. The preferred cooking utensils are wooden ones, as this will protect the surface of the pan. 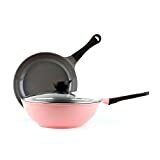 Every pot and pan in this cookware set features a ceramic coating that gives the surface a nonstick property. This is very safe to cook on as there ate no harmful toxins within the coating. It is also PFOA and PTFE free. The ceramic coating coupled with the cast aluminium creates the perfect cooking environment. Very little oil is required with no pre heating, and the pan heats very quickly to help seal food in its own natural juices. It provides a much healthier way of cooking. 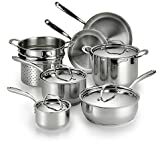 The cookware set comes with a variety of different sized lids. Four of the lids are made from cast aluminium and the lid that matches the large grille pan is made from safety glass. All lids feature a knob that stays cool, even while on a hot stove. A really useful safety feature on each lid, is that there is a steam vent, situated just under the knob that helps to prevent overflow while on the stove. This also helps to control the temperature while cooking. All of the cookware pieces have two safety handles that are looped in design for easy grip. They are also designed to sty cool even when the pot or pan is incredibly hot. They also help to manoeuvre the hot pot or pan easily from stove to oven. The large grille pan also has a large helper handle that is ergonomically designed and is made from silicone for an easy grip. All of the handles have been designed with a rivet less appearance to make them easier to hold and easier to clean. This 6 piece cookware set includes the following: a 7″ sauce pan; an 8″ stockpot; a 9.4″ stockpot; a 10.2″ stockpot; an 11″ wok; a 10.2″ grill with glass lid. There are also a range of 4 differently sized pan lids that are made from cast aluminium. With such a diverse range you are able to create family meals on both the stove and oven. They are also suitable to use on a hot plate. All pieces are presented in the romantic pink color and all feature two safety handles for safety and ease of use. Q. Can yo use metal utensils with this cookware? A. Due to the cast aluminium, metal utensils are not recommended as they can damage the surface of the pan. Wooden and plastic utensils are preferred. Q. Is this cookware set safe to use in the microwave? A. No, you cannot use any of the pieces in the microwave or on an induction stove. 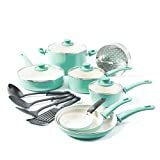 If you are looking for a fresh and fun cookware set, that is incredibly versatile and practical, then you cannot go far wrong this 6 piece nonstick cookware set by Neoflam. It cooks food quickly, food will not stick or burn and it will look beautiful sat in any kitchen. It is also very easy to clean. It even features a wok! It is incredibly safe to use as well as being good value for money.